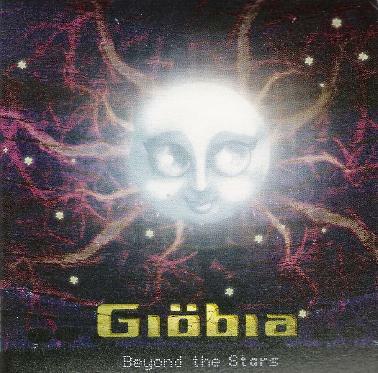 Giöbia - "Beyond the Stars"
Imagine if the Ozric Tentacles or Ship of Fools were more song oriented and had a female vocalist and you might get something like Italy's Giöbia. The band consists of Marinella Mastrosimone on vocals, Stefano Basurto on electric & acoustic guitars, bouzouki, oud, sitar and synthesizer, Matteo Curcio on bass, synthesizer & theremin, Stefano Betta on drums, Paola Di Francesco on violin & cello and Paolo Bashurto on darbouka, tambourine, bodhran, tammorra & synthesizer. As far as I can tell this is their first album. The CD opens with "Politurbo", which is full of head bopping, toe tapping grooves, propelled by cosmic space synths and trippy Eastern influenced guitars and percussion. This accessible song within a space rock context characterizes much of the album and has had me loving Giöbia since the first time I heard it. "Caught in Analogic Memories" is a dance party in space tune with a guitar sound that's like U2's The Edge reacting to his first exposure to Hawkwind. "Mathar (Anjuna Charas Beach Party)" is another spaced out dance party tune, but this time the sitar transports us to the Maharaja's palace. "Green Tea" gets even deeper into the body twirling Indian grooves. It's all instrumental except for Marinella's seductive chants, and has a great psychedelic-progressive feel. There's a few songs that are a bit different and make interesting use of varied musical styles. "A Window on the World" has elements of 80's new wave and more of that spaced out U2 guitar sound, along with the ever present space electronics. "Waiting for Another Moon" is in some ways one of the more straight forward rock songs of the set. Yet it's still way outside the box, combining country and Celtic influences in interesting ways. "The Rudessela's Ritual" is more firmly in the Celtic-progressive realm, but with an underlying spacey-psychedelic glow. Finally, there's the 13 minute title track, which has some of the most blazing space rock on the album. The song transitions through multiple segments, beginning with an early 70's kind of Italian progressive guitar and rhythmic sound, while Marinella's vocals help to keep things firmly in the modern world. After a few minutes the band draw back and we're in a peaceful transitional segment with sitars, chanting, and a generally trippy atmosphere. This builds up for a bit until the band finally launch into a space rocking jam. But the PEAK is yet to come when in the last several minutes Giöbia take off into a total fiery space rock jam along the Hawkwind/Ozrics axis. Wow, what a finish! In summary, I doubt Giöbia consider themselves to be a space rock band, though it's pretty clear that at least some of their members are fans of Ozric Tentacles, Hawkwind, Gong, etc, as the influences are sufficiently overt as to propel the music into space rock territory, while at the same time molding their own genre bending sound. Definitely one of my favorites of 2005. For more information you can visit the Giöbia web site at: http://www.giobia.com. However, last time I checked it didn't seem to be available, so visit their distributor, Ethnoworld Music, at: http://www.ethnoworldmusic.com.